Music, a Movie, Holiday Spa Gifts OH MY! It's a given. The Pearl Public Library will always showcase great programs and events! The month of November is no exception! For starters, the Friends of the Pearl Library sponsored Big Book Sale is starting Thurs. Nov. 1 from 1 p.m. to 7 p.m and running Fri. Nov. 2 from 9 a.m. to 4 p.m. and Sat. Nov. 3 from 10 a.m. to 2 p.m. The $5 a bag sale will be going on all day on Saturday. Everything you can stuff into a grocery bag for just $5!!!! WOW! What a bargain! All proceeds benefit the Friends' group. Just to share a few wonderful programs for November, there's Zoe Brumfield - Lady Piper - on tap Tues. Nov. 13 at 6 p.m. for the library's Family Night. 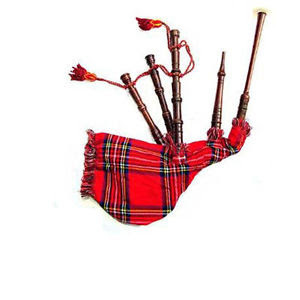 Zoe Brumfiled will play the bagpipes as well as speak about Scottish culture and dress! Pizza Shack of Jackson will provide yummy pizza! Family Night offers a different program every second Tuesday of the month at 6 for the entire family to enjoy! The monthly big screen, Third Thursday Flicks is Thurs. Nov. 15 at 5:30 p.m. The night, featuring the delightful movie, Home for the Holidays rated (PG-13), comes complete with popcorn and drinks! What a great way to enjoy an evening out...FREE! O00h la la, talk about relaxation and mmmm mmmm decadence!!! How about learning how to make your own lavender bath soap and peppermint foot soak!!! Doesn't that make you wanna holler!!!! You know it does!!!! So, come on in for this month's How-To Tuesday program- DIY Holiday Spa Gifts on Tues. Nov. 20 at 6! The How- to Tuesday, adult program, is every third Tuesday of the month at 6 p.m. Remember all programs are free! There's really so so soooooo much more going on! 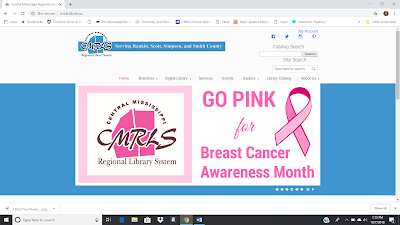 Check out the Central MS Regional Library System's website at www.cmrls.lib.ms.us and click on EVENTS for a full calendar of events, not only for the Pearl Public Library, but for all 20 CMRLS libraries!!!! "We will each write a ghost story," said Lord Byron, and his proposition was acceded to. There were four of us....I busied myself to think of a story - a story to rival those which had excited us to this task. One which would speak to the mysterious fears of our nature and awaken thrilling horror - one to make the reader dread to look around, to curdle the blood, and quicken the beatings of the heart. If I did not accomplish these things, my ghost story would be unworthy of its name." Talk about a challenge, issued by Lord Byron himself! Quite the writing group and next door neighbors: 18-year-old Mary Wollstonecraft Shelley, poet Percy Bysshe Shelley, physician John Pollidori, and Lord George Gordon Byron. The setting was Switzerland in the summer of 1816 when the now historical challenge was issued. However, writer's block can prove to be a dread in itself. Every morning, Mary was asked the same question, "Have you thought of a story? ", and every morning the answer was no...until the nightmare. In her dream, Mary saw a "pale student" kneeling over what was described as a hideous sleeping corpse until...his eyes open and he stands! Mary opened her own eyes in terror, and thus began the creation of the horror novel FRANKENSTEIN, now celebrating its 200th year of publication! Mary's quote from the book's introduction breathes life into the idea that still surrounds the story today, "I have found it! What terrified me will terrify others; and I need only describe the spectre which had haunted my midnight pillow." The next morning Mary announced that she had "thought of a story", the first line beginning with the words, "It was on a dreary night in November." The book was published in 1818, and just like the scientist who brought the monster to life, FRANKENSTEIN was a fully-formed work of fiction at its creation. How do you do? Mr. Carl Laemmie feels it would be a little unkind to present this picture without just a word of friendly warning. We are about to unfold the story of Frankenstein, a man of science who sought to create a man after his own image without reckoning upon God. It is one of the strangest tales ever told. It deals with the two great mysteries of creation: life and death. I think it will thrill you. It may shock you. It might even horrify you. So, if any of you feel that you do not care to subject your nerves to such a strain, now's your chance to uh, well ---WE WARNED YOU!! (Another note of trivia: Carl Laemmie was an American filmaker and a founder of Universal Studios.). Mary Wollstonecraft Shelley received no formal education but spent her years as a young girl in a library. What a fitting way to celebrate the 200th anniversary of the author's most famous literary work and the horror genre she helped to create than in a library with a group of teens. Join us from 7:00-9:00 p.m on Tuesday, October 30th, as we serve up the heart of FRANKENSTEIN, along with a few fingers and a couple of eyeballs. Come Gobble Up a Good Juicy Program at the Pearl Library in November! They say being thankful pays off. Well, it really does at the Pearl Public Library! Sure does! One lucky person is going to win big! Yeepppp! You read that right!!!! The Pearl Public Library is featuring Why I Am Thankful For the Pearl Library program starting Thurs. Nov. 1 and running through Mon. Nov. 19 for a chance to win a $25 gift certificate donated by Wal-Mart of Pearl. All you have to do is fill out an entry at the reference or circulation desk telling why you are thankful for the library. The drawing will be held on Tues. Nov. 20! Can winning be any easier than that?! Don't think so! The holiday season is well underway, and we at the Brandon Library are excited to show you everything we have in store for November! Join our crafting groups each Thursday beginning at 1:00 pm to learn more about piecing quilts and improving your free-motion quilting technique while making quilted pot holders! No sewing machine? No problem. Thanks to our LSTA So, Sew! grant, we have up to 10 machines and kits for you to use! Call us at (601) 825-2672 to reserve your spot and receive a supply list. You can break those new pot holders in with something delicious and sweet when on Thursday, November 8 at 6:00 pm, we learn how to make the perfect pie crust! Call to register, and feel free to bring a pie plate, pie cutter, and rolling pin if you have them! We have fun planned for you little ones, too! Join us for Family Night on Thursday, November 15 at 6:00 pm to learn about the first Thanksgiving with Bonnie Peagler while eating pumpkin pie in a cup! Looking for that perfect piece of holiday decor? 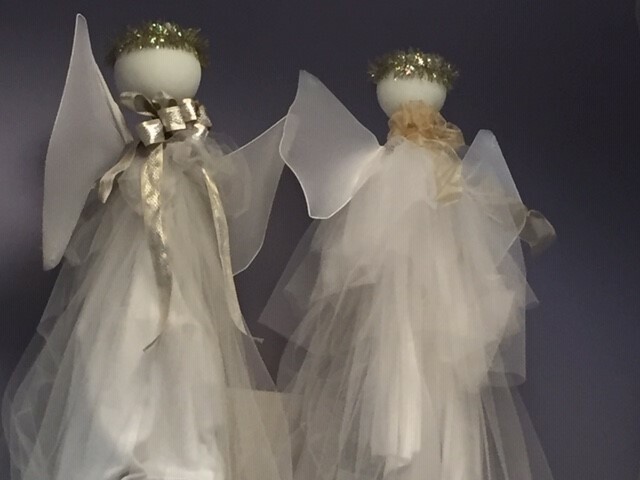 Join us at the library on Monday, November 19 at 6:00 pm to make a Tomato Cage Angel! Call (601) 825-2672 to register your spot and to receive the supply list of materials. With all this making and baking, don't forget to stop by our Falun Dafa classes every Saturday at 2:30 pm for a little self-care! Cleanse your mind and reduce some of that stress with these gentle meditation classes lead by Stephanie Zhang. Coming to the Morton Library in November. October is winding down, and November is just around the corner. First of all, we would like to congratulate our Teen Read Week Bookmark Contest winner! We would also like to give a big thank you to Sonic in Morton for the very generous donation of a gift card for the prize! This month we will be having a carnival program that we are very excited about! We would love to make it an annual event if we have a good response this year. So, read on to find out more! We will be celebrating International Games week by having our first Candy Carnival on November 8 at 5:00 p.m. We will have games, such as, bowling, fishing, dart games, bean bag toss, and pin the nose on the clown. We will also have popcorn, drinks, prizes, and of course, you can’t have a candy carnival without candy! So, bring the family and join us for some old-fashioned carnival fun! You can't be on the CMRLS website without reading about our new Acorn Card. It's a card to encourage children and vulnerable adults to do more reading. This is just a quick note about the importance of not just your child reading, but about the importance of you as a parent reading aloud to your child. My daughter has just finished getting her master's degree as a Reading Specialist. She teaches middle school age youth who have trouble with their reading skills. One thing she has shared with me is how important it is to read aloud to your children. This can be for youth of all ages, especially those who have trouble with reading. They frequently can sound out the words but because of the time it takes, it's hard for them to understand what they have read. Plus, this time can create special memories. I grew up on a small farm in Kansas with 6 of us kids. There was always something that needed done and my mom stayed very busy. I have one special memory of that time about reading. One winter my mom found a series of books at a library that she read to all of us as we gathered around the heating stove. It was the story about three teenagers called the three Jolly J's. (I have never been able to find these books.) I would probably been a young elementary student at the time (many years ago), but I remember how we couldn't wait until the next time Mom had time to sit down and read some more to us. I don't know if that is when my love of reading started, but it is still my favorite way to entertain myself. So, take advantage of your library card, find something your child is interested in and make time to read to them. They will benefit as will you. Don't Miss the Big Book Sale Bonanza at the Pearl Public Library! The Pearl Public Library’s Big Book Sale sponsored by the Friends of the Pearl Library, one of the library’s most popular events, will run for three days on Thurs. Nov. 1 from 1 to 7 p.m., Fri. Nov. 2 from 9 a.m. to 4 p.m. and Sat. Nov. 3 from 10 a.m. to 2 p.m. 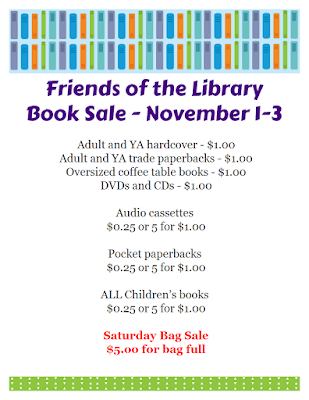 The last day of the book sale, on Saturday, is $5 bag day sale. For that whole day any books you can fit into a grocery bag will be only $5. Regular book sale prices range from .25 cents to $1.00. 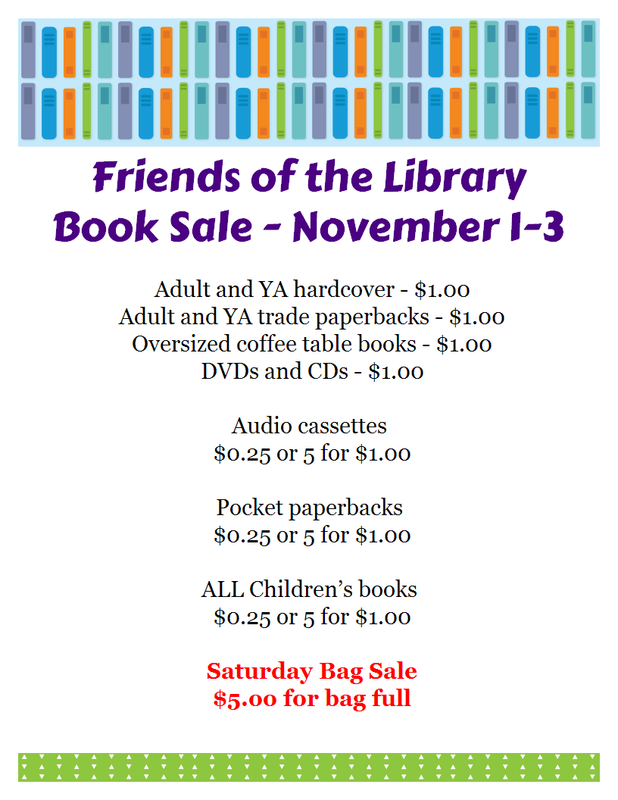 All the proceeds benefit the Friends’ group, which supports the library through volunteering, purchasing books and equipment and sponsoring programs for all ages. For more information about the book sale, you can contact the library at 601-932-2562. 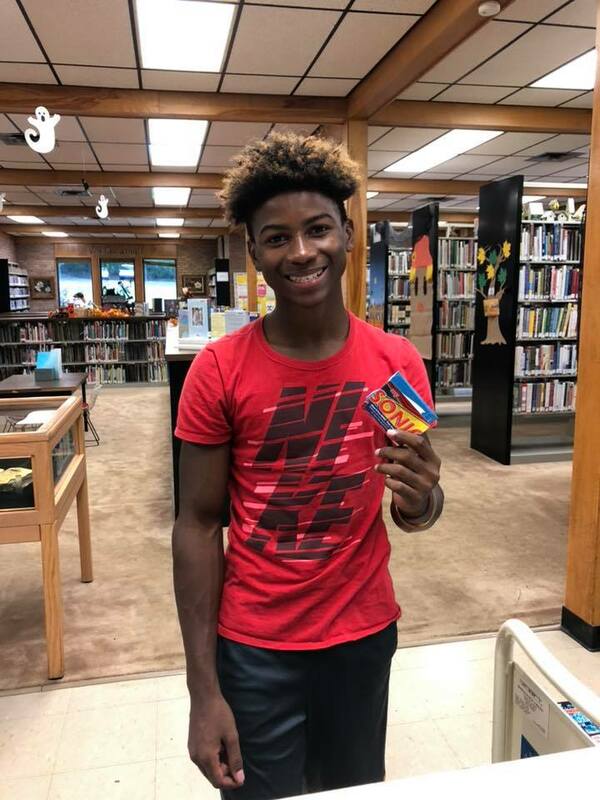 The Mendenhall Public Library is again partnering with various businesses and organizations in Mendenhall and Simpson County area to offer Halloween Candy Lane for the community’s children. Children 12 years of age and under are invited to come to trick-or-treat on Monday, October 29th from 4:30-6 pm. Patrons will be required to enter through the library doors, make their way through the line and exit through the community center doors. Children will be given a special treat bag to collect their goodies and will be allowed to go through the line one time only. Children’s hands will be stamped as they come through and must be present to trick-or-treat. Any business, organization or individual who would like to participate and pass out treats to children, please contact Rhoda or Sylvia at (601) 847-2181 by the 26th of October. 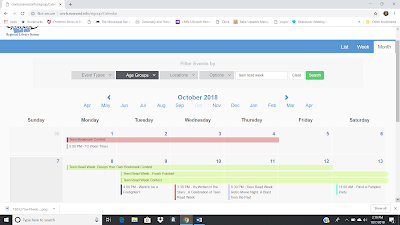 Each year this event continues to grow and each year we have parents express their gratitude for hosting this event and offering a safe environment for their children to trick-or-treat, which we could not possibly do without the help and participation of the businesses! October is one of our favorite months of the year here at the Brandon Library. What's not to love? The weather is finally beginning to taper off from the scorching days of summer, and the holiday season is about to kick off with a bang. So, in that case, why not start the season off here with your local library? Trust us, you're not going to want to miss what we have coming up. Speaking of the holidays, we all know that the last three months of the year mean celebrations, crafts, and of course, cooking. Lots and lots of cooking. Some of us have our holiday food schedules in the bag. When we're not cooking, we're crafting! Join us on Saturday, October 27 for part 1 of our Sweatshirt Jacket Art Project. You'll need a sweatshirt, material scraps, thread, and a sewing machine. If you don't have that last one, don't worry--we have a machine for you! Call the Brandon Library at (601) 825-2672 to register. There is a limited number of sewing machines available, so hurry while supplies last! Already feeling that holiday stress? Make sure to stop by on Saturdays for Falun Dafa classes lead by Stephanie Zhang! Achieve inner tranquility and glean the mental and physical health benefits from the gentle meditation classes every Saturday from 2:30-3:30 PM. Last but not least, what is October at the Brandon Library without our annual Fall Festival? On Thursday, October 25 at 6:00 PM, join us here at the library for tons of games, snacks, face painting, bouncy houses, and more! All ages are welcome to join in the fun, and while costumes are totally optional, they're definitely encouraged. Happy fall, everyone!! 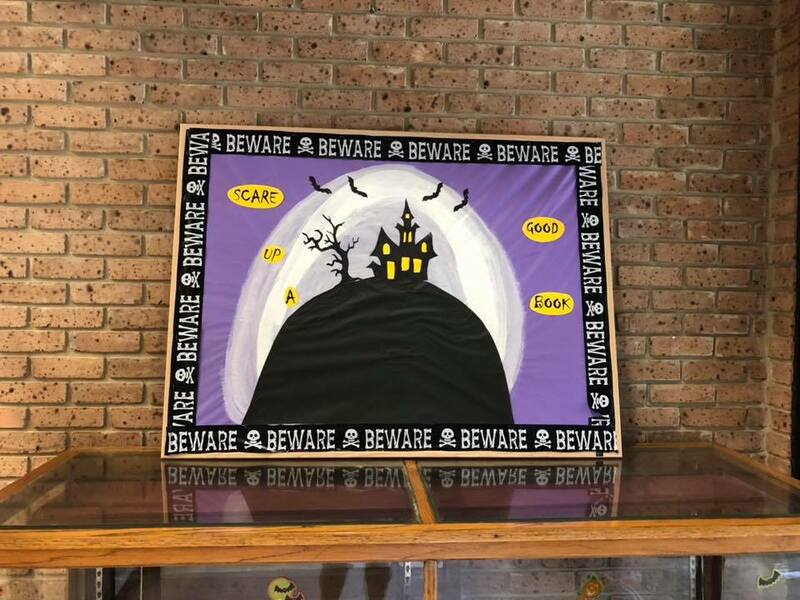 October is finally here which means Halloween is just around the corner, and the Morton Library is decorated and ready for some spooktacular Halloween fun! So, if you are looking for some something fun to do for Halloween; the Morton Library has got you covered! Our entire program theme for the month of October is Halloween, and we have lots of exciting things happening this month! 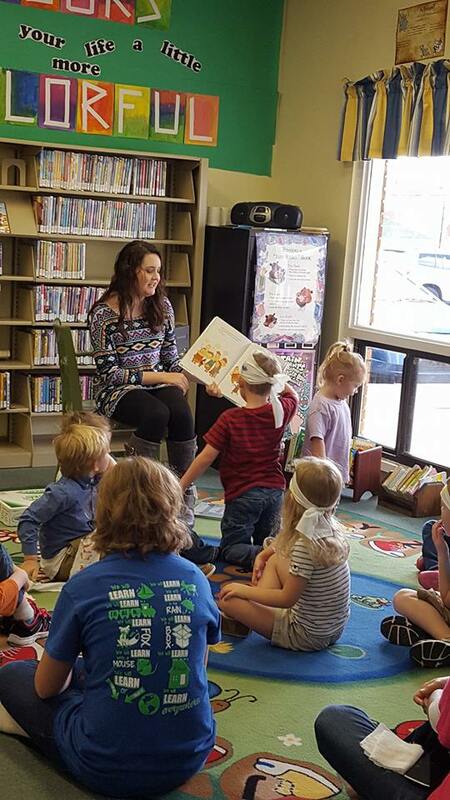 Every Tuesday morning at 10:30 we have Preschool Story Time. So bring your little ones, and join us for stories, music, and crafts! This month we will be having Halloween stories and crafts to go along with them! For our teens this month we will be having a Halloween movie night on October 18th at 5:00 p.m. We will be showing the Halloween classic, "Hocus Pocus." The movie is produced by Walt Disney Pictures, is rated (PG), and the runtime is 1hr and 35 mins. We will provide popcorn and soda for a snack while supplies last. Do you like spooky stories, fun costumes, and magic tricks? If so, you will love storyteller, Dianne Butler! She will be here on October 25th at 5:00 p.m. to tell spooky stories and do a few magic tricks for us! So, wear your costumes and join us in the Halloween fun! 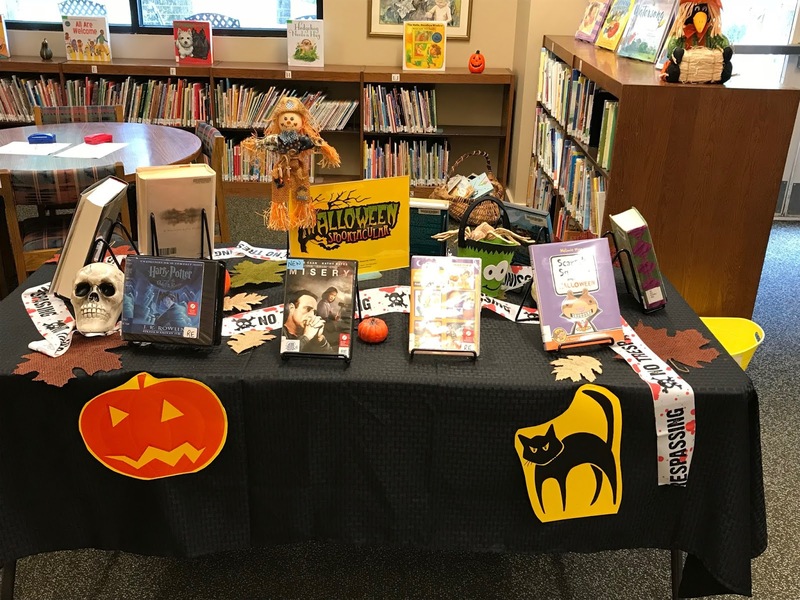 So come by the Morton Library to check out our Halloween displays and programs this month, and maybe get a spooky book or two! I just want to take a moment to introduce myself, I am Nicholas Edward Parker. I am the new branch manager at the Northwest Point Reservoir Library. I have been at the Reservoir for a month now getting to know the library and the various patrons who visit daily. 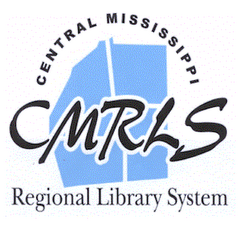 I have been with the Central Mississippi Regional Library System for 10 months. I look forward to getting to know each of my patrons. Join us for National Teen Read Week as we celebrate the week dedicated to showing teens across the nation the joys that only reading can bring! 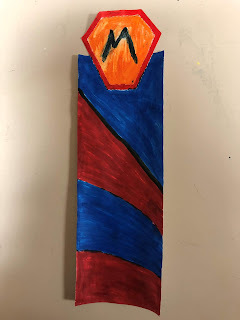 The theme for this year’s National Teen Read Week is “It’s Written in the Stars” In honor of this observance the Reservoir Library is holding a design your own bookmark contest for all our local teens! Please come to the circulation desk to get your bookmark to design your own unique take on the theme for this year. The Contest will be held October 8th through 7th. The winner will be drawn on October 15th and notify on the same day! The Grand prize is a jar of Halloween Candy! Good Luck to all our talented artist! May the best bookmark win! Every third Tuesday night we will test our trivial knowledge skills as we battle with others to win a gift card for Mugshots great food. If you are a Trivia master, then join us for the ultimate battle for the title of trivia king! Free Rotel for all and as always lots of fun and friendship! October 25th at 1 pm we will hold the first in a series of book clubs called the Brown bag book club. Bring your favorite book and a brown bag lunch for a fun-filled lunch hour of reading and friendly discussion as we dive into the world of fine dining and literature. Deserts will be provided! Our Library fish Uno has had a very busy summer! Not only has he been checking out books to read at night in his sunken pirate ship, but he has also been in touch with some of his favorite authors over the summer with ideas about how they can better their books for their readers both fish and people alike. Come by the library to tell Uno what you would like to see in your favorite authors' books. During the week of October 21st through the 27th, we want to thank our Library Friends Group for all that they do for the librarians who work in the libraries! We would love for you to join the Friends! Please stop by the Reservoir Library and pick up a Friends signup sheet to join this great group to give back to your local library. As a bonus, we will throw in some cookies to thank all our new friends for joining! During the month of October, we are starting a brand-new Library card! October 1st is the debut of our Acorn Cards! With this card, you can check out up to two items and not have to pay any fines for overdue items. We encourage all parents with young children to come to the library to sign up for one of our Acorn Cards. We also encourage our special needs patrons to register for one as well! Already have a library card but want to get an Acorn Card? No problem! We will be glad to change your account from a regular library card to an Acorn Card. All fines from your previous library card will be waived when you sign up for an Acorn Card! During the first month, all names will be put into a drawing for a secret grand prize! What will it be? Who knows! Keep your eyes out for our library squirrel Acorn. She may be visiting her friend Uno while she is checking out books to take back to her tree to read! 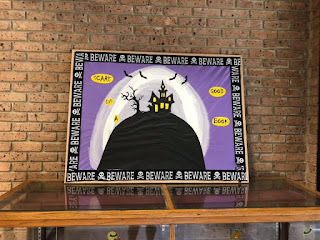 During the month of October come to the library to see our many Halloween Displays! The theme for this month is Spooktacular! Come to the Reservoir to see our very own Spooktacular display and log onto Facebook to like and share our pictures so that the Reservoir Library will win the first-place prize! While you are visiting the library keep an eye out for the pieces of candy that have been hidden throughout! Who put it there? Was it the ghost or the librarians? Be on the lookout for the many different ghost and goblins that visit the library as well during Halloween! We have many fun and exciting events planned at the Northwest Point Reservoir Library for the month of October. We hope to see all our patrons attend these events free of charge and encourage them to bring their friends and families with them as well so that they too can see the many services that libraries can offer them and the community. 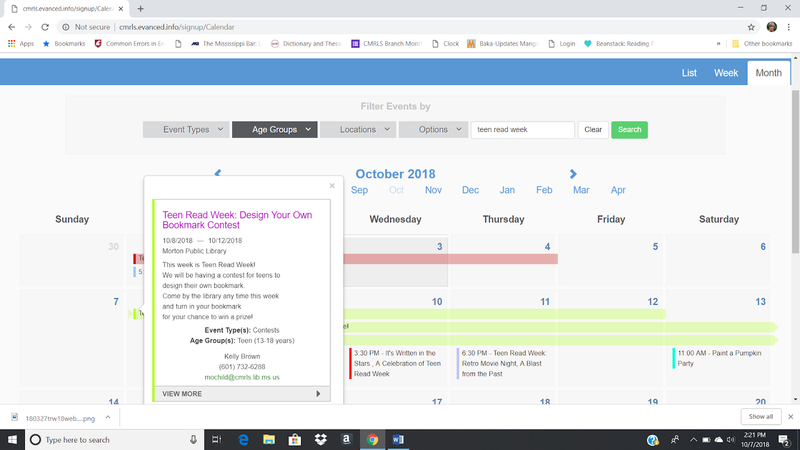 Click on Events and type Teen Read Week in the search box. If interested in a particular program, click on the program and additional information will be shown. October is here, which means the Brandon Public Library has a brand new story for you and your family. 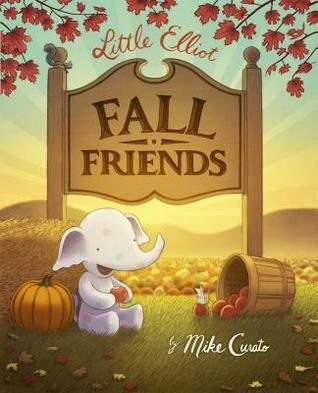 Come by and take a stroll around the park as you read this month's story, Little Elliot, Fall Friends by Mike Curato! Little Elliot and his friend Mouse are about to go on an adventure, and you're invited! Tired of the noises and the crowds that come with city life, Little Elliot and Mouse decide that they want something a little different. Together, they'll take a trip out to the sprawling countryside and learn what life is like outside the big city, enjoying the beauty of fall as they've never seen it before! What are you waiting for? Come to the park and get your own taste of fall along with Little Elliot and Mouse today! 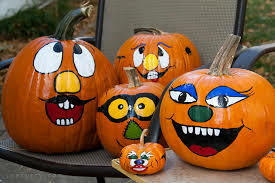 Join us on Thursday, October 18, 2018 at 6:00 P.M. for Pumpkin Painting. It will be fun for the whole family. The Friends of the Richland Library will be providing small pumpkins as well as all the painting supplies, but you can bring your own pumpkin if you choose too. All you need to do is bring your family and your creativity. We are asking you to register here, by October 17, 2018 so we can make sure to have enough pumpkins. Not Your Typical Taco Tuesday! For people who love Mexican food, Taco Tuesday is their favorite night of the week! But this week, Taco Tuesday at the Forest Public Library celebrates the authentic foods and festivities of the Hispanic and Latino American culture and the heritage those traditional foods represent. The Hispanic Heritage night is scheduled for Tuesday, October 2, beginning at 6:00 p.m.
"We have an ever-growing Hispanic and Latino American patronage at the Forest Public Library. During Hispanic Heritage Month, which is celebrated nationwide from September 15 to October 15, we schedule a celebration night to honor this important demographic of our community. Last year, the ladies of the Hispanic community served homemade empanadas, tamales, and taquitos. This year's food focus is the tasty taco with all its many varieties," states librarian Dianne McLaurin. According to the food blog Fix.com, tacos date back to the days when Montezuma and the Aztecs ruled Mexico. A fascinating reference fact found in the article entitled A Guide to Authentic Mexican Food is how the original taco served as a makeshift lunch box for the farmers in the field. Wives would wrap the food in the tortillas to take to the field pickers for their midday meals. Thus, the humble taco was born! Mexconnect.com states that the urbanization of Mexico and the movement of large groups of country people to the cities led to the popularity of those first tacos. The term taco comes from a Spanish word meaning "light snack" and soon, these snacks evolved into the street tacos that we enjoy today. The practicality of the taco in its easy-to-carry, easy-to-eat form led to taco stands springing up in Mexico City offering taco specialties from all parts of the country. Never think of Taco Tuesday the same again! Regional differences, methods of preparations, and garnishes elevate the status of the common taco into the unique taco. Most tacos are made with soft tortillas while others are fried until crispy. The fillings can range from refried beans for the most authentic tacos to a host of bite-size meats, ranging from turf to surf. Once again referencing the mexconnect.com article, "the taco vendors or taqueros use a huge block of wood - a tronco - resembling a tree trunk, and an impressively sharp cleaver with which to hack the meat swiftly and skillfully into the bite-size pieces...in the blink of an eye." Taco garnishes range from fresh ingredients to salsas to dried chiles. Lime wedges, radishes, cucumbers, cilantro, tomatillos, and white onions are used as toppings for traditional tacos. However, what is not found on an authentic taco is cheese...not even Mexican cheese! And tacos certainly don't come in a store-bought package! The term "Hispanic" refers to a person of Cuban, Mexican, Puerto Rican, South or Central American, and other Spanish culture or origin regardless of race, as defined by the U.S. Census Bureau. According to the latest census, more than 50.5 million people identified themselves as Hispanic or Latino. This year's Hispanic Heritage Month theme is Hispanics: One Endless Voice to Enhance Our Traditions. Join us Tuesday night as the library salutes the Hispanic tradition of the terrific taco! And a little something extra for the kids...a taco pinata! How To Tuesdays Makes An Intro At The Pearl Public Library! That's right! Lisa is on a roll! 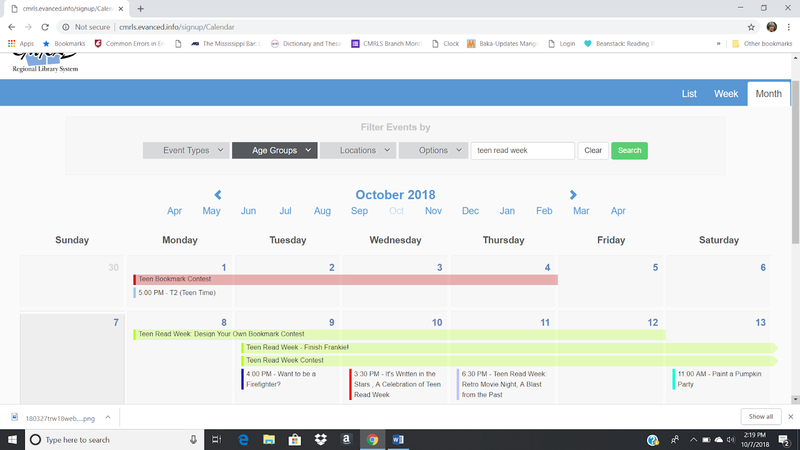 She's lining up great events for her new How To Tuesdays happening every third Tuesday of the month starting this month (October)! First up is her Resume Writing Class, Tues. Oct. 16 at 6 p..m. which will be held in the Pearl Library's computer lab. Lisa says she looks for this to be a successful program, because "we have noticed multiple requests for resume help - sometimes daily - from patrons, and feel like this truly is a community need." Lisa will cover things like the basic steps to writing a resume which include using brevity (that means don't use too many - or unnecessary - words!!! ), matching your skills to the job you hope to land and using key words and action verbs. It's a free program and no reservation is needed! 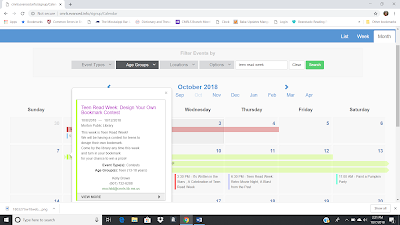 Now, writing a resume is a serious matter and fits perfectly in the How To Tuesdays format, however so do events that are totally entertaining and lots of fun! And, Lisa has that covered in future programming. Uh-huh, she sure does! How about DIY Holiday Spa Gifts! Yep! That's coming Tues. November 20 and Make Your Own Handprint Snowman Ornament on Tues. Dec. 18. 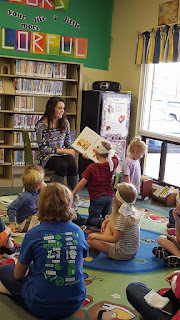 Remember all the How To Tuesdays are at 6 p.m.
Hey, while we are on the subject of Tuesdays, mark your calendar for the fabulous Fall Festival, Kristen has planned for the Pearl Library's October Family Night on Tues. Oct. 9 from 5 p.m. - 7 p.m. It's not called Family Night for nothing! Bring everybody! Participants are welcome and encouraged to wear Halloween costumes! Tuesdays are happening at the Pearl Public Library! You don't want to miss a thing!